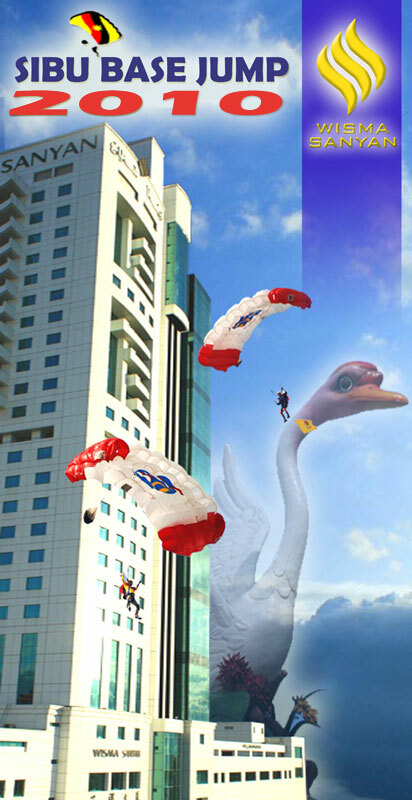 Sibu BASE Jump 2010 will take place in October straight after KL Tower International BASE Jump Malaysia 2010. Sibu is located in the East Malaysian state of Sarawak on the island of Borneo. Flights from Kuala Lumpur to Sibu take approximately two hours. Contact Gary Cunningham for application details. Sibu BASE Jump 2010 has finished for this year. We had 5 foreign jumpers and 5 Malaysians completing 213 BASE jumps during the 3 day event. Day 1 we had a nice morning practice session. The scheduled practice night session had to be cancelled due to head winds. Day 2 was an awesome full day of jumping, continuing on with a night session. Crowds of spectators arrived in the evening which added to the atmosphere of night jumps. We saw 2 people amassing a large amount of jumps that day with 25 and 28 jumps each. In the evening we went to the Sibu Residents house to sample some locally made rice wine. Day 3 saw even more crowds in the morning. We all had lengthy photos sessions with the spectators after each landing. It was a great feeling to be welcomed to the city and have the crowd showing their appreciation for our jumps. The day ended with our closing dinner at the Bawang Assan Longhouse where we got to participate in some of their traditional dances and the rice wine flowed all night long. I find the Sibu locals are even more warm and friendly than the people in West Malaysia. Sibu BASE Jump 2010 certainly made up for what was lacking at Menara KL’s event this year. Aziz Ahmad for coorganising the event with me. All the BASE jumpers for coming and having a great time. We expect to have a bigger and better event there next year.